There are a lot of contemporary design ideas using wall stickers. This one I particularly like. 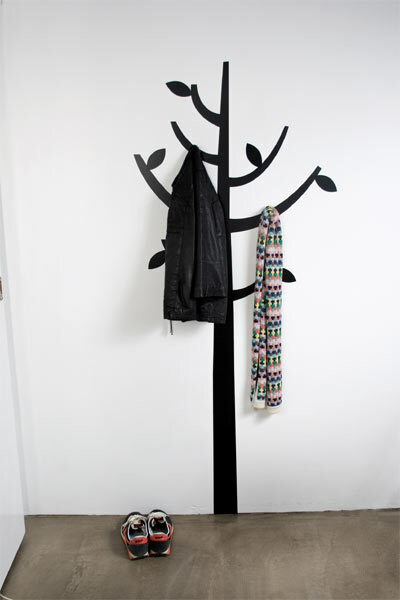 Not only is it a dynamic graphic design, it is also a great space saver. Absolutely no floor space is lost to what could be a traditional piece of furniture. 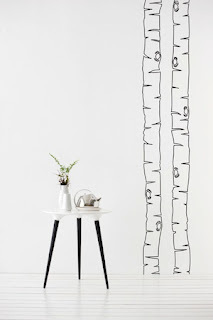 This example is from Ferm Living and they have many others. As a DIY person, a roll of blue painter's tape, some black paint and some hooks could make this a truly affordable sleek solution. 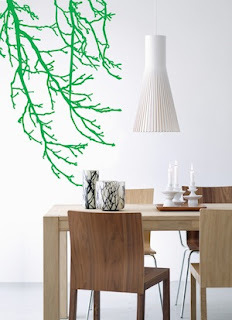 Ferm Living has a series of wall stickers that are worth looking at. Many would give a room a focal point with a little design humor attached. Interesting that I am partial to their trees. Go to their site to see flowers, birds, suitcases, bikes, and telephone poles. There is a series of wall stickers at Amazon as well. These are much more affordable but a different design level. 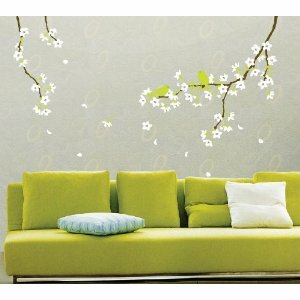 An Amazon search on Wall Stickers leads to thousands of hits. Having never used wall stickers I wonder how easy/hard they are to remove when it is time for a change. Anyone have experience with them?